I know, I know, seeing a Hebrew word is unsatisfying. ּּBut the true, “correct” spelling of the word is in Hebrew, and it’s het-nun-vav-kaf-heh. That’s actually the answer to why there are so many spellings. All the English variants are just approximations of a word which is actually in Hebrew. Foreign words often don’t have “correct” English spellings. Some of the spellings of חנוכה are more common than others, of course. 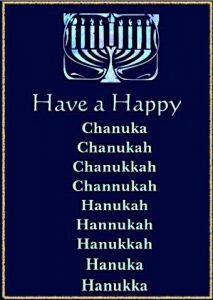 Hanukkah is the most common, followed by Chanukah. Rendering the sounds of one language directly into another is called transliteration. This is not always easy, because often the sounds of one language aren’t produced in another. Sometimes there are simply no characters to spell the sounds that you need to say. 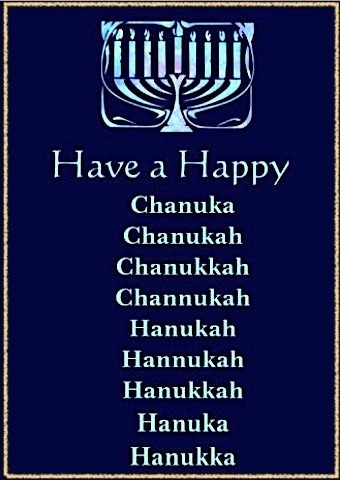 The first letter of חנוכה sounds kind of like a roughened “h,” so some spellings start with “ch” and some with “h.” Since English doesn’t have this exact sound, we just choose a close equivalent. You might have noticed that with hallelujah has many variations in spelling too. A similar thing happens with a lot of Hebrew words. Sometimes you see chutzpah, sometimes chutspa or hutzpah or hutzpa. You find both Torah and Tora used, and shema, shma, and sh’ma. That’s because the real word is in Hebrew, and the English word is just an approximation. Assuming that there should be one correct, authoritative spelling of a word is a relatively late development in English, actually. Spelling became standardized only after the printing press was invented in the 1400s. Shakespeare once wrote a letter which included his name in four places, and every single time he spelled it a different way. 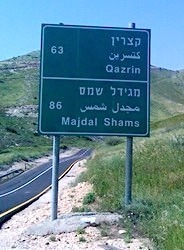 If you drive around Israel, you’ll notice a related phenomenon on road signs. 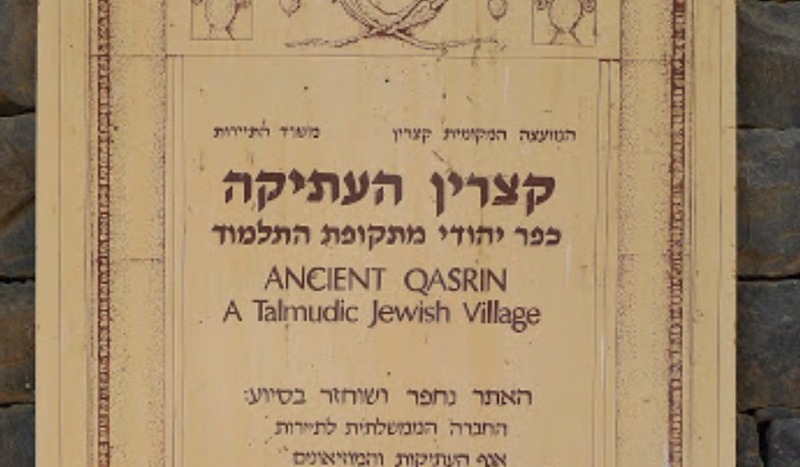 Take a look at these signs that point the way to a historic village near the Sea of Galilee. 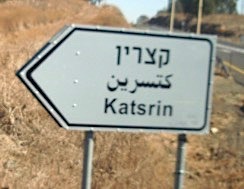 In one the name is spelled “Katsrin” and another its “Qazrin.” You’ll also see the name spelled “Katzrin,” “Kazrin” and “Qasrin.” Even government signs will have variations. Why? Because of the assumption that the English spelling of the town’s name isn’t terribly important. It is just a rough approximation of a Hebrew word. If you want to spell the name correctly, spell it in Hebrew. 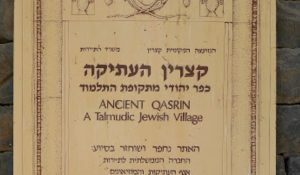 I once asked a rabbi if I could contribute some books that had been damaged in a flood, and his answer surprised me. Only the ones that contained the name of God in Hebrew, (yod-heh-vav-heh) needed to go there, not the ones in English. I found this fascinating, and it challenged my monolingual assumption that English was the measure of all human speech. It was hard for me to even imagine words existing that weren’t written in Roman characters. When I first encountered Hebrew, I crassly quipped that all of the letters looked liked little boxes, except for the one that looks like a crown (ש). It stretched me to imagine that those cryptic little boxes actually do make sounds. And, they are actually required to spell a word as important as the name of God! (1) Israel was commanded to blot out the names of foreign gods (Dt. 12:3), and the converse is that they will not “blot out” the name of their own God. This applies to when God’s name is written in a permanent form, like on a piece of paper, but not when it is impermanent, like on a website. Some Orthodox websites will point out pages that contain the name so that if readers print out the page they don’t dispose of it casually. For this reason, I simply didn’t put the Hebrew letters on my page at all. Another way to show respect is to employ a substitute like Adonai (meaning “Lord”) or HaShem, (meaning “the name”). That is the reason that Bible translations traditionally have used the word “LORD” whenever the name of God appears in Hebrew. Interesting….sometimes hard to realize english is not the language of others…. Thanks for explaining this, Lois. Fascinating! I didn’t realize you didn’t use the Hebrew letters for God’s name until I read the footnote. I’ve been interested in learning the Hebrew alphabet lately. I started with aleph. It’s going to be a slow process. Ha! In the world of mathematicians, the iconic example of multiple transliterations is the name of the Russian mathematician Chebyshev (or Tschebycheff, etc.) There’s a fun little book about this, The Thread by Philip J. Davis, a Jewish mathematician.